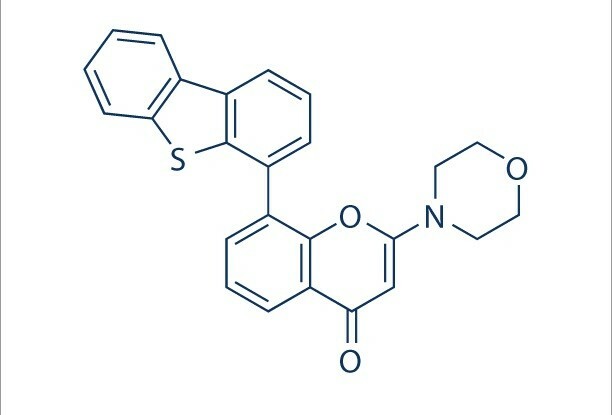 Relevance NU7441 is a highly potent and selective DNA-PK inhibitor. Selectivity Also inhibits PI3K with IC50 of 5 μM in cell-free assays. In vivo applications NU7441 intraperitoneally administrated at dose of 10 mg/kg maintains for at least 4 hours shows nontoxic and increases etoposide-induced tumor growth delay 2-fold in mice bearing SW620 xenografts. In vitro applications NU7441 increases the persistence of γH2AX foci after ionizing radiation–induced or etoposide-induced DNA damage. 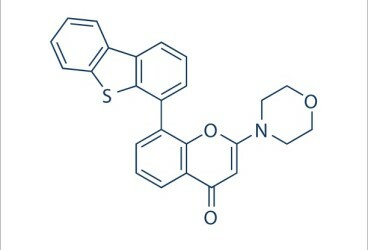 NU7441 (0.5 μM or 1 μM) appreciably increases G2-M accumulation induced by ionizing radiation, etoposide, and doxorubicin in both SW620 and LoVo cells. NU7441 causes persistence of doxorubicin- and ionising radiation-induced DNA double-strand break and also slightly decreases homologous recombination activity DNA-PK-proficient M059-Fus-1 and DNA-PK-deficient M059 J human tumour cells. NU7441 inhibits UV-induced RPA p34 hyperphosphorylation in a dose-dependent manner both in cells lacking and cells expressing polymerase η. NU7441 increases levels of fludarabine-induced γH2AX foci and correspondingly decreased fludarabine-induced cell death in chronic lymphocytic leukemia cells. NU7441 also inhibits mitoxantrone-induced DNA-PKcs autophosphorylation and repair in chronic lymphocytic leukemia cells. Zhao et al. 2006. Cancer Res. 66(10):5354-62. PMID: 16707462. Preclinical evaluation of a potent novel DNA-dependent protein kinase inhibitor NU7441. Leahy et al. 2004. Bioorg Med Chem Lett. 14(24):6083-7. PMID: 15546735. Identification of a highly potent and selective DNA-dependent protein kinase (DNA-PK) inhibitor (NU7441) by screening of chromenone libraries.